Ofcom has approved Orange and T-Mobile to deploy superfast mobile date ahead of its rivals. The decision means the two networks, operating under the shared banner of Everything Everywhere, will be able to deploy 4G data networks as of September 11 this year. However, as Ofcom notes, the exact rollout will depend entirely on Everything Everywhere's commercial strategy, which the network tells TechRadar will be begin on a smaller scale (for devices such as dongles) by the end of 2012. The move will allow speeds to increase fivefold over current 3G conditions and allow on the go data not only for laptops, tablets and phones but will also enable items like cars to benefit from data connectivity too. The likelihood is that the opportunity to use 4G services on your phone in the UK won't be available until early 2013 as the network ramps up the deployment of the service, so those that buy the new iPhone 5 later this year won't be able to use its 4G capabilities until a few months into the contract. The news comes at the same time as reports that 3 is in talks with Everything Everywhere to purchase some of its 1800MHz spectrum, which would see it given a much bigger advantage in the forthcoming 4G spectrum auction. The Telegraph is stating that the networks are in advanced negotiations to sell of a chunk of the spectrum for up to £450m, although Everything Everywhere believes this figure may be a little high. The Orange and T-Mobile merger was only allowed to go ahead on the condition it gave up a portion of its spectrum ahead of the auction, and these talks are likely to be part of that deal. The move will anger the other UK networks, which maintain such a decision will allow Everything Everywhere a competitive advantage during the period when it's the only operator to serve 4G to the nation while the auction to divide up the rest of the 4G spectrum is ongoing. However, Ofcom states: "We consider on the evidence available that any such advantage is unlikely to result in an enduring advantage which distorts competition to the detriment of consumers." 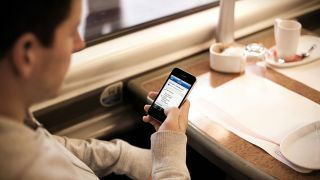 TechRadar is contacting all the other network operators in the UK for a response, but this certainly isn't the last we'll be hearing of this landmark decision.